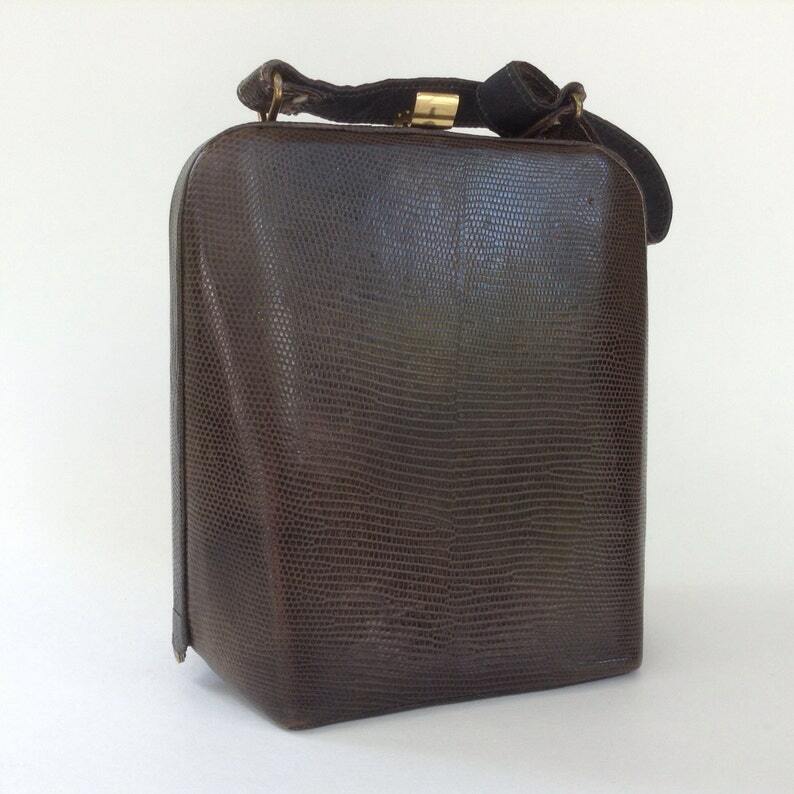 This beautiful lizard skin purse may be petite, but it's chock full of vintage style! The smart-looking bag has a structured, boxy triangle shape. The brown lizard skin (with grey undertones) is in very good condition - with a smooth texture and subtle variations in color and tone. The leather is supple with no cracks or breaks. Very minimal wear on bottom edges and one light scar (see photo one at 6 o'clock and photo four) only visible at a certain angles. The metal frame is skin-wrapped. The polished gold-tone clasp, positioned on the middle top of the frame, opens easily and closes securely. The 3/4" wide handle is made of the same lizard skin on one side (fabric on the other) and is attached to the bag by gold-tone rings. The handle is stitched with a taupe-colored thread. The inside lining is clean - a black satiny fabric with a small slip top pocket on one side. The piece is unmarked. The bag measures 6 1/4" wide by 6 1/2" high (at top of frame) by 3 7/8" deep at base / 1 1/8" at top.